Sometimes I wait for the right story, or perfectly composed messages to share here. Once upon a time I used to just share words and images, as they happened. I didn't worry about them needing to be 'on brand' or fit within a theme or category. I just wrote what I felt, thought, saw, made, wanted to make... You can still read my old blog from all those years ago. I am planning on bringing some of my old blog posts over here, but as always time is time and mostly I want to play in the garden with my little ones or sit and sip tea and stitch or weave. Or chat with my husband. So... it might take a while, or it might never happen. At any rate. 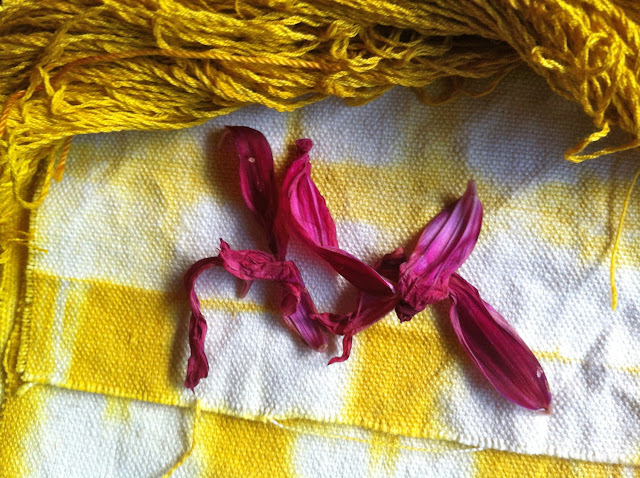 Here's some lovely photos I took of some of my botanically dyed fabric pieces. And they're so pretty I thought I should share them here, rather than only always sharing things on Instagram. I dyed these with a combination of my bundle dye method and hot dye methods (both of which I talk about in my online course). Using gathered flowers and leaves, as well as kitchen scraps. I wish I could tell you what each one was individually coloured with, but this is a selection over time, and my dye note keeping isn't that excellent. The piece below (on the right) was dyed wrapped around an old tin can (we barely ever buy these, so I've not had them to experiment with before. Now I'm saving whatever I find, because I love the way it dyed - the colours and the patterns). The yellow through the middle was from dried sweet pea flowers. I didn't get them in the dye pot while they were still fresh, but I'd like to try that because I think the purple blooms might have given a purple colour. One fell, while still fresh and juicy, onto a piece of cloth and coloured it .... a stain or not, I'm not sure. These were all bundled up, tucked into the fabric and then wrapped around the metal tin (what metals do they put in those tins?). And then cooked on and off over a day. This silk had no mordant, the metals in the tin and the iron (rusty nails) that I had in the water would be enough mordant, especially on silk. Plus I won't be wearing this fabric or heavily exposing it to sunshine. 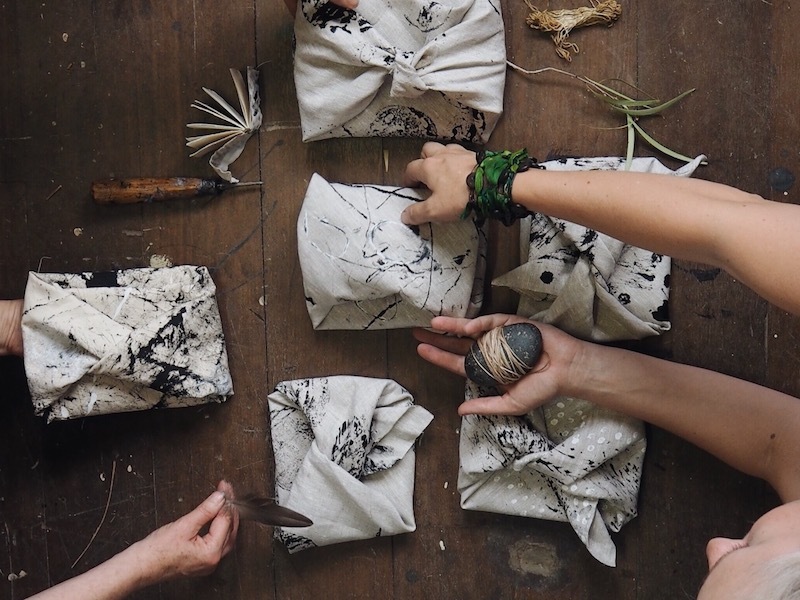 I took these photos as part of some styling videos for my upcoming Unfurl & Bloom online course. I shared some of the ways I style my creative work, especially for Instagram. I'm thinking of writing a little ebook thingy as a free download, would you be interested? I've been looking back at my old blog this past week, and it made me sad that I don't blog regularly anymore. And that all the "rules" of being in business, combined with an increasing want for privacy, I don't share photos or stories of my little ones any more. Especially as they're getting bigger. My blog used to be a diary; I don't keep a paper diary, or have a very effective photo archiving system. My blog did a good job of that. So... I might start blogging again, maybe less of the kids, but more of my thoughts and processes and the things I'm making / made / working on. And not worry too much about the rules of blogging for indie business that say you must tag all your photos to be pinterest worthy, or you have to think about seo in the post heading and first sentence. And you have to be on brand, or why would people visit. My favourite blogs to read (not that I read as many as I used to), are simply the ones that share the stories and life and what we're all going through as humans together in this funny world.